Long before he was an award-winning novelist, Salman Rushdie was a small boy in Bombay who fed his imagination by going to the movies. Sitting in a darkened theater, Rushdie would absorb the Technicolor pageantry of “The Wizard of Oz,” an American movie standard, so like a fantastical Bollywood film, that would become “my very first literary influence,” he says. In fact, the movie would inspire the 10-year-old to write his first work of fiction, Rushdie revealed in a classroom discussion during his final teaching visit as a University Distinguished Professor in Emory College. Now lost to the ages, “Over the Rainbow” told the story of a “a boy like me in a city like Bombay walking down the sidewalk and finding not the end of the rainbow, but the beginning of the rainbow,” arcing up like a staircase and leading to grand adventure, he said. Although Rushdie’s father would eventually misplace his son’s earliest work, the experience of writing it would secure the nascent roots of his own tradition of telling stories woven with strong elements of the fantastic. “My father got his secretary to type (the story) up and then said, ‘I’ll keep it, because if you keep it you’re going to lose it,’” Rushdie told a group of Emory students in Amy Aidman’s “Children and Media” class during his recent campus visit. For students, the lesson is met with laughter — in fact, many are surprised to find that a literary luminary who made history for what he endured in the name of free speech can also be engaging, accessible and downright funny. That intellectual dexterity — and a willingness to see where a classroom conversation takes him — has made Rushdie a popular speaker during his visits to Emory over the past decade. And like following the proverbial Yellow Brick Road, students have been eager to see where the acclaimed author will lead them in the classroom. From discussing the roots of his own writing through “The Wizard of Oz” to a somber discourse on the slums of Bombay, from exploring the intersection of disability rights and human rights, to joining students for an impromptu read-through of Shakespeare’s “A Midsummer Night’s Dream,” Rushdie’s annual campus visits have contributed to a legacy of unique learning opportunities. Rushdie’s relationship with Emory stretches to 2004, when the award-winning author was invited to present an address for the Richard Ellmann Lectures in Modern Literature series. As a University Distinguished Professor working out of the Department of English, Rushdie would embrace the role of visiting scholar, lecturer and colleague, engaging the campus community on a wide orbit of topics. This year’s visit began with a Feb. 15 public lecture on "The Liberty Instinct" and ended Feb. 26. 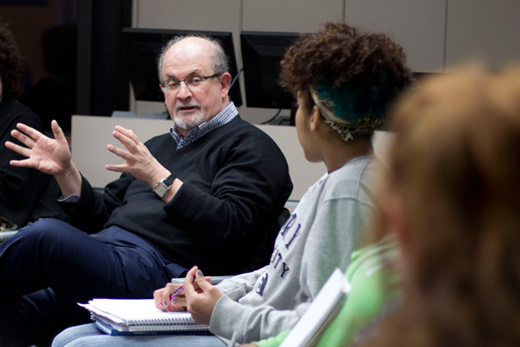 As he concludes his professorial role at Emory, it is Rushdie’s congenial and generous classroom presence that many will remember most fondly. “One of the most remarkable things about a conversation with Salman Rushdie, whether one-on-one or in a large group, is the sense of the personal,” says Coalition of the Liberal Arts (CoLA) Chair Robyn Fivush, associate vice provost of academic innovation and Samuel Candler Dobbs Professor of Psychology. For students, the CoLA event offered a rare glimpse at the man behind the book jacket. “I knew he was a great writer and about the political stir that ‘The Satanic Verses’ caused, but I didn’t know much about his life beyond that,” admits Hayley Silverstein, an Emory freshman. She found Rushdie’s account of conflict with his father over choosing a college major both humanizing and encouraging. During his annual two-week teaching visits to Emory, Rushdie earned a reputation as something of an intellectual chameleon. One afternoon, he might be found discussing contemporary India with students in an advanced Hindi class or exploring writing craft with select faculty members. Another day, he is chatting with undergraduates about the books that have been his greatest influences, or joining a roundtable discussion about human rights and human disabilities within a panel discussion that includes Eva Kittay, Distinguished Professor of Philosophy at Stony Brook University and Senior Fellow of the Stony Brook Center for Medical Humanities, Compassionate Care and Bioethics, English professor Benjamin Reiss, and Rosemarie Garland-Thomson, a professor of English and Bioethics, who co-direct Emory’s Disability Studies Initiative. “If there are such a thing as rights, they must derive from human nature — those things which are in our nature to do as human beings,” Rushdie explained at the Feb. 24 human rights forum. In each appearance, Rushdie glides into each new conversation as easily as slipping on a fresh pair of reading glasses. As a global citizen who has lived at the intersection of multiple cultures, Rushdie will be remembered for the accessible perspective he brought to a vast range of classes and disciplines, says Gordon Newby, Goodrich C. White Professor of Middle Eastern and South Asian Studies. “Students could talk with him not only about how he deals with those intersections, not only in terms of his literature, but in terms of his life,” Newby recalls. Looking back on Rushdie’s tenure at Emory, “we can be pleased that he was a professor with us and that our students were up to the challenge of working with an educator of his caliber,” Newby adds. In English Professor Sheila Cavanagh’s Shakespeare class, Rushdie could be counted on to contribute beyond the role of a traditional guest lecturer, often joining students for informal read-throughs of the Bard’s famed plays. “I was definitely intimidated, pretty much prepared to come to class and just listen,” says Metz, a senior majoring in biology and classics. Quite often, according to Cavanagh. In fact, Rushdie’s unwavering willingness to engage students, both intellectually and personally, is a quality she has long admired. “Every year we focus on a different play together and he’s arrived prepared to speak on that text, but also ready to follow conversations wherever they may lead,” she says. Last week, Rushdie also met with students in Holli Semetko’s upper-level social science course "India Today: Economics, Politics, Innovation & Sustainability," inviting questions on any topic, from his writing process to his views on current Indian politics. As always, Rushdie “was witty, erudite and thoroughly engaging,” reflects Semetko, Asa Griggs Candler Professor of Media and International Affairs — even indulging a good-natured request from students to pose for a photo with the entire class.